Tribal leaders as well as the Puget Sound Leadership Council, the governing body of the state’s Puget Sound Partnership, are calling for a study of “targeted management” of seals and sea lions that would include a look at potential revisions to the Marine Mammal Protection Act (MMPA). The resolution is spurred by recent scientific findings that say harbor seals are flourishing to the point that they and, to a lesser extent, sea lions may be harming the size of populations of young Chinook in Puget Sound. Predation of West Coast Chinook has risen six-fold since 1975, according to a recent paper in the journal Scientific Reports. That could be undercutting salmon recovery efforts, the paper said, also harming endangered southern resident orcas that rely almost exclusively on Chinook for food. Increased consumption of Chinook salmon by seals and sea lions in the Salish Sea “could be masking the success of coastwide salmon recovery efforts,” according to a 2017 study published in the journal Scientific Reports. 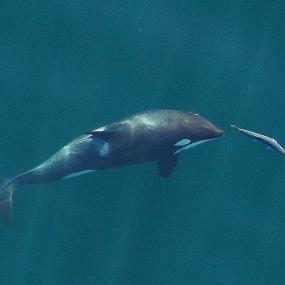 Endangered resident orcas are said to be declining in part due to a lack of available Chinook, the orcas' preferred prey. Some see it as a classic food web trade-off pitting predator against predator, something that is increasingly urgent as the local orca population declines to 76 animals, its lowest level in three decades. Much of the discussion centers around the growth in Puget Sound’s harbor seal population. Once hunted for bounties and sport, their numbers have greatly increased since the establishment of the MMPA in 1972. There are now more than 50,000 harbor seals living in the Salish Sea, making this among the most densely populated areas for the pinnipeds in the world. 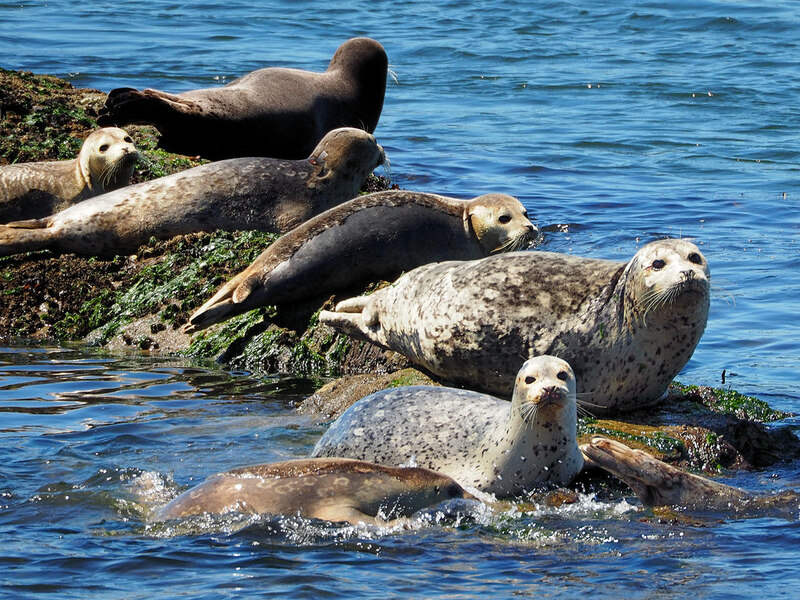 Harbor seals far outnumber the region’s sea lions and eat the most salmon of the two groups. The Puget Sound Partnership’s Leadership Council has pledged to take a hard look at the subject. In a Nov. 1, 2017 meeting, the Leadership Council approved a formal resolution to boost Chinook recovery work and a list of regional priorities approved by tribal officials and the Salmon Recovery Council. The list includes a wide variety of recommended "bold actions" — from protection of salmon habitat to improvements to water quality. It also takes on the issue of predation, calling for a white paper analyzing the impacts of pinnipeds and looking at potential law changes “to allow targeted management of pinnipeds on salmon” according to a document approved last September (PDF). What “targeted management” means has yet to be defined, but some say it could include a wide variety of options — among them lethal and non-lethal removal of seals and sea lions in certain cases. Such options are currently not allowed under the MMPA and would require congressional action to become legal. “I imagine it could include lethal removal,” said David Herrera, chair of the tribal management conference and a member of the Puget Sound Salmon Recovery Council. “But maybe there’s other actions we can take with it where you don’t have to go there." Non-lethal options might be numerous, he speculated, such as providing alternate food resources or making vulnerable Chinook areas uncomfortable for predators. In theory, such actions would help revive the Chinook population, providing more food for endangered southern resident orcas, while not harming the viability of the populations of harbor seals and sea lions that have rebounded under the MMPA. But the idea of lethal government measures against any marine mammals remains a fraught subject. State wildlife officials say they are aware of the studies showing the potential impacts of pinnipeds on salmon, but are quick to point out that they don’t know what form of predator management might be implemented, if any. “We’re still in the exploration stage. We’re not ready for management action is my sense at the moment,” said Scott Pearson, a research scientist with the Washington Department of Fish and Wildlife. Despite the large amounts of Chinook being consumed by seals, scientists say there are still many questions about the specific impacts. Pearson said studies have not concluded definitively that predation is the kind of dominant factor in the survival rates of young Chinook to justify population controls. He uses steelhead as an example. Those populations have shown some problems with parasites and genetic issues that could be influencing the amount that get consumed by marine mammals. The question is further complicated by the fact that there are just as many if not more pinniped predators in Alaska where the salmon populations are more robust and scientists say pinniped predation is not an issue. Harbor seals also eat upwards of 60 species of fish, not just salmon. 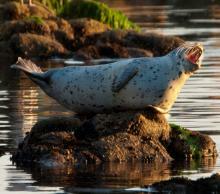 Would changes in harbor seal populations impact other aspects of regional biodiversity? Harbor seals (Phoca vitulina) are the most commonly seen marine mammals in the Salish Sea and can be found throughout the region year round. They have been intensively studied within the Salish Sea and this species profile provides an overview of what is known about them. It was produced for the Encyclopedia of Puget Sound by the SeaDoc Society. If targeted management did occur, the scope of potential ways wildlife managers might try to cut down predation rates could be broad, officials said. Hypothetically, problem predators could be given alternate food resources. The way salmon are released from hatcheries could be changed. Or if there’s a way to make a vulnerable Chinook area uncomfortable for mammals without simply shifting the predation to a different spot, that too might happen. Understanding "the potential management options" would be explored in the proposed study called for by the Leadership Council in its November resolution. While revision of the MMPA may only be speculation at this point in Puget Sound, it's been done elsewhere. Sea lions on the Columbia River can be trapped and euthanized by state officials because of the high predation rates there. However, the Sound is a different ecosystem to manage than a river where all the fish have to pass through a single fish ladder. “In Puget Sound, you have many different rivers coming onto that system, and all of those rivers have different ecosystem effects,” Pearson said. While discussion in Puget Sound has been evolving, a simultaneous political development has been gaining momentum elsewhere. A bill in Congress, filed by U.S. Rep. Jaime Herrera Beutler last July, would expand removal of California sea lions to give tribes the ability to take the animals on more of the Columbia and its tributaries. The bill cites findings that up to 3,000 California sea lions have been foraging along the lower 145 miles of the Columbia, and taking at least 20 percent of the spring Chinook run. If passed as written, the legislation would enable the killing of up to 100 sea lions there. David Herrera said he and other tribal officials learned of the Columbia River sea lion bill while they were assessing how predation factored into the priorities for salmon restoration. He said it offered some precedent for building a case for population management in the Sound as well. “We looked at that and said, if we need to, somebody’s taken the lead on that,” Herrera said. But Puget Sound presents a different quandary than targeting specific predator sea lions across 145 miles of river. Eric Ward, an ecologist with NOAA’s Northwest Fisheries Science Center, said the complexities of trying to weigh pinniped protection against the needs of Chinook salmon — and the humans and orcas that harvest them — are magnified by the expanse of the Sound. “You don’t have a pinch point where you can remove some pinnipeds and have an impact on the predation issue,” Ward said. The idea of killing animals of one species to promote the viability of others has also provoked controversy. The Humane Society has attempted to use lawsuits to block efforts to cull the predatory sea lion population on the Columbia River, saying that natural predator-prey behavior is being blamed for human-caused salmon mortality. Sherrie Duncan, a Tacoma marine biologist, said the idea of removing some of the Puget Sound’s flourishing population of harbor seals could have unintended consequences for the rest of the ecosystem, and compared the situation to the removal and reintroduction of wolves in Yellowstone National Park. “The top predators are part of a functioning ecosystem,” Duncan said. She noted that transient orcas have returned to South Sound waters more frequently in recent years, as the seal population has grown. “It seems to me it (lethal pinniped population management) would further imbalance the ecosystem, because it’s just another Band-Aid fix,” Duncan said. State officials said there is no set timetable for when or if a policy change might be formally contemplated. The process is complex; scientific studies are required before a law change is drafted to allow population-control efforts in theory. Government work to decide how to take action would only follow that. Derrick Nunnally has written about governance and the environment for Pacific Northwest news organizations since 2015. As a staff writer for The (Tacoma) News Tribune, the Philadelphia Inquirer and the Milwaukee Journal Sentinel, he has covered public-policy debates at the local, regional and national levels. He holds bachelor's and master's degrees from Columbia University and lives in Tacoma. How Are Seals Different from Sea Lions? Video of How Are Seals Different from Sea Lions?